CISA’s Be a Local Hero, Buy Locally Grown® public awareness and marketing campaign was launched in 1999 and has since become the country’s longest running and most comprehensive “buy local” program for farm products. This year 265 farms and landscape/garden centers, 64 restaurants, 43 retailers, 24 institutions, and 16 specialty producers have joined together to raise awareness and sales of locally grown farm products. 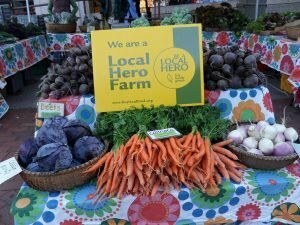 The Local Hero campaign uses a wide array of paid advertising (print, radio, and web) and public relations (press releases, events and appearances) to engage the public and increase support for local farmers. And it works! Enroll online, and learn more about the benefits of membership, by clicking on the links at the right-hand side of this page. Contact Devon Whitney-Deal at 413-665-7100 x22 to learn more about the Local Hero program. 39.85% of participating farms reported net income increases from agriculture over the last year. 93.07% of respondents were satisfied with the Local Hero membership program. Over 78% of residents of Franklin and Hampshire counties and 52% of Hampden county residents recognize the Local Hero logo. People who recognize the logo are twice as likely to shop at their local farm stand or farmers’ market or to choose local product at their grocery store.